Habitat: Upland, Mountain. It grows in dry, sunny locations. Description: The wild rose-like flowers have 5 petals and are 2 inches (5 cm) wide. 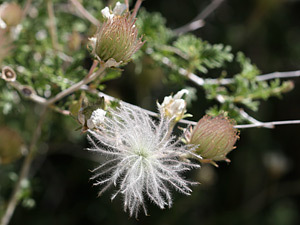 The flowers are followed by dense, fluffy clusters of pinkish green, feathery seeds that fade to white as they mature. The leaves are small, alternate to clustered, fuzzy, and have 3 to 7 pinnate lobes and rolled under edges. 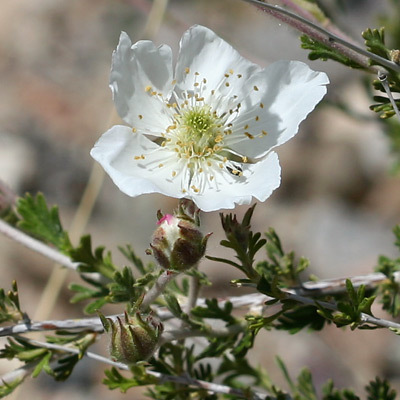 The similar Stansbury Cliffrose (Purshia stansburiana) has smaller flowers and fewer feathery seed plumes. Butterfly Plant – The flowers attract butterflies and native bees.